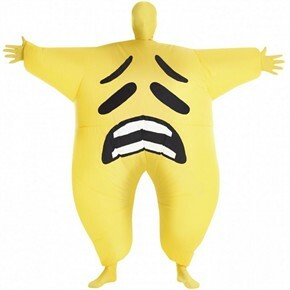 The Adult Sad Emoji Morph Suit Costume is the perfect addition to an emoji group costume. Emojis are great to use texting, on Twitter, and to make the funniest memes. The sad emoji adds balance to the crying tears of joy emoji. Slip into the inflatable suit, turn on the fan, and watch the Megamorph inflate in a minute. Are you the bubbliest and happiest person in your friend group? Then put on this sad emoji suit for an ironic Halloween costume. Batteries not included. One size fits most. Availability: The Adult Sad Emoji Costume takes approximately 1 business day to leave the warehouse.